While perusing some of my favorite food sites, I happened upon a video from someone who calls himself The Hippy Gourmet. He was making Paprika roasted potatoes and Kale pesto. I simply had to try it. Let me tell you, Kale pesto is AMAZING. I think it’s even better than the basil or arugula pesto I’ve made in the past. 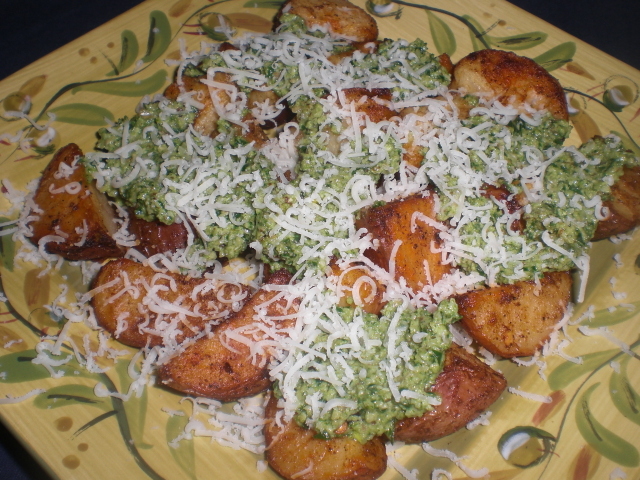 The crispiness from the potatoes with the creaminess of the Kale pesto and an added punch from the grated Romano is heaven in your mouth. You will LOVE this recipe. Par boil your potatoes so they are soft, but not to the point of mush. Drain and toss with enough oil to cover, paprika, garlic powder, salt and pepper. Spread out on a baking sheet and bake on 450 until crispy (about 40 mins). 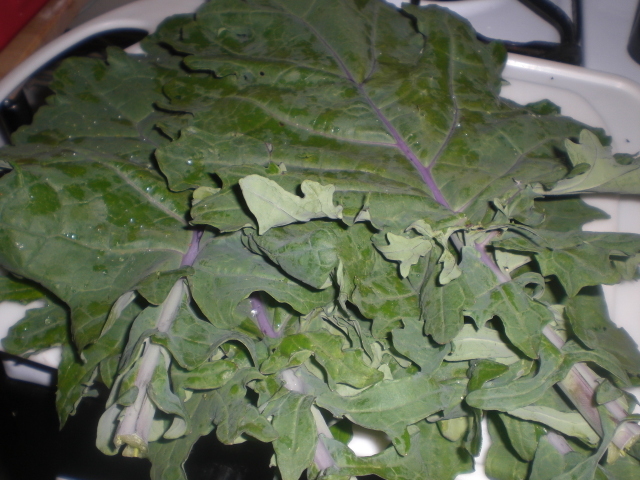 Remove the hard stem from the kale and drop into boiling water. Boil kale until soft. This only takes a few minutes. Drain off the kale and put into a food processor with the garlic, walnuts and cheese. Pulse until finely ground. Drizzle in enough olive oil to bind it all together. You want it nice and thick, not oily and runny. 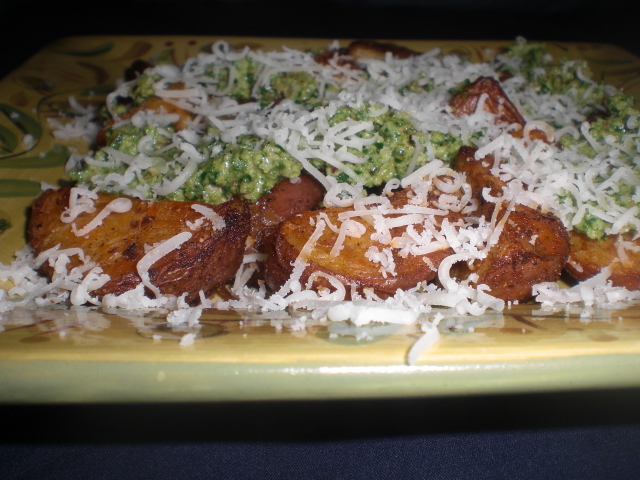 While the potatoes are still warm, dollop the pesto over the top. Shave some cheese over the pesto and enjoy! 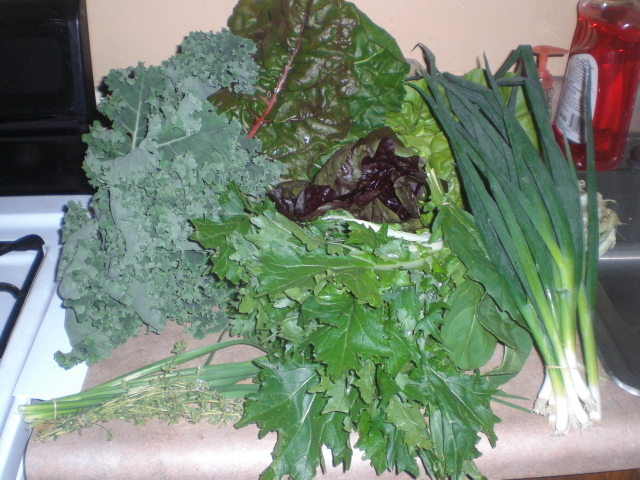 There were some beautiful baby beet greens in my CSA box this week. I normally don’t make greens on a regular basis but wanted to do something with these. I had some ground lamb in my refrigerator and a lemon leftover from making lemonade. I figure I would put it all together and see how it turn out. Noting short of fabulous. 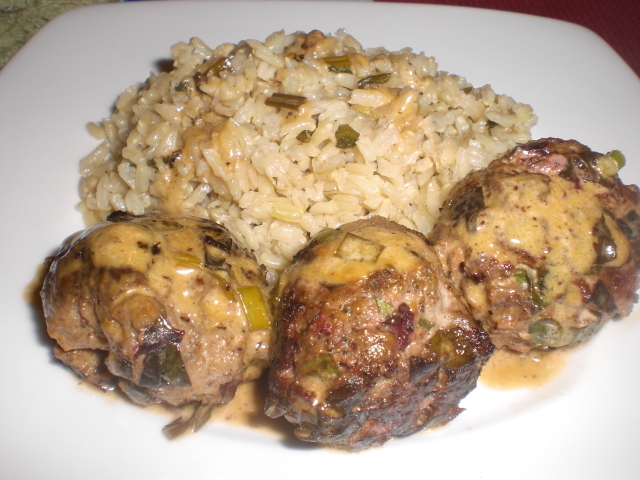 I paired the meatballs with some herbed rice using the oregano that was in my CSA box as well. This dish was easy to make, easy to clean up and most of all fantastic. Perfect weekday meal. In a mixing bowl combine all ingredients but the oil. Mix well with hands until all ingredients are mixed in well. Roll into 1-2 inch balls. 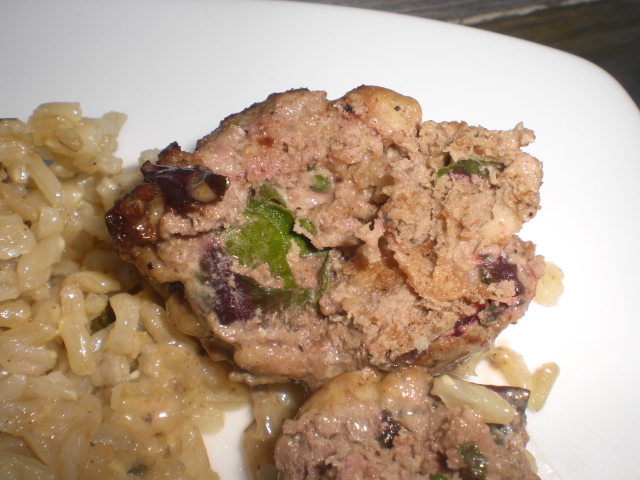 Heat oil in frying pan and cook meatballs until brown on all sides. Don’t worry about the inside, they will cook in the sauce. Take meatballs out of pan and let drain on some paper towel. De-glaze the pan with the lemon juice making sure you get all the good bits from the bottom of the pan. Add in the butter until melted. Add in the garlic, chives and heavy cream. Stir until well blended and heated through. 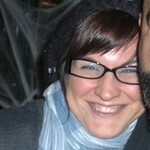 Add back the meatballs. Cover and cook 15-20 minutes. In a sauce pan melt the butter then add the rice. Let the rice sauté until lightly browned. Add the water, garlic and oregano. Bring water to a boil then turn the heat down and let the rice simmer for 20-30 minutes or until rice is tender and there is no longer water in the pot. Today is the day I’ve been waiting all winter & spring for. 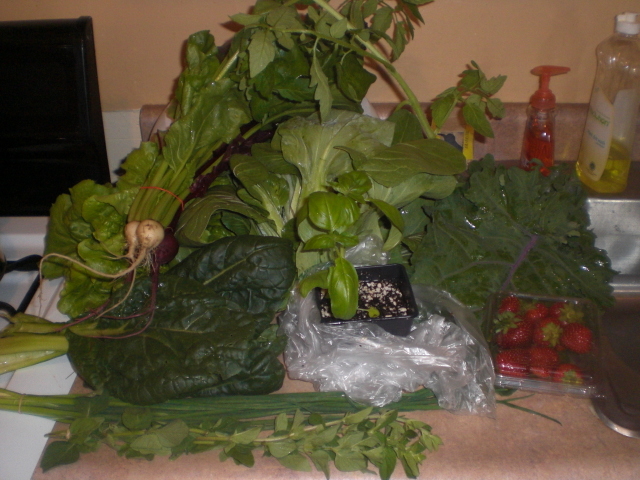 The 2010 CSA season has begun. And true to form, HighCross Farm did not disappoint. The strawberries lasted Oooooh I’d say three minutes once they came out of the box.